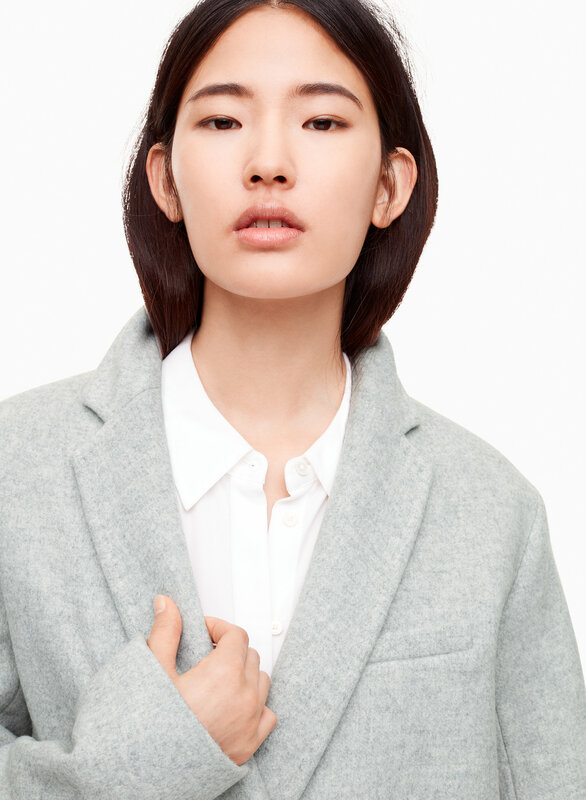 This heavyweight cocoon coat is tailored using the finest virgin wool and cashmere from a premier mill in Prato, Italy — renowned for its production of elevated textiles. The fabric is soft, warm and naturally resistant to wind and water. This is such a nice coat - way thicker and more substantial than the stedman. I sized down to XXS in this coat. It keeps you really warm so I recommend this for colder climates. the sleeves are too long for Asian. actually same things happen to most of the coats. The Wintour Coat was beautiful. Wonderful Quality. The fit was too large for me…so I would order a medium next time. The coat was a little too “boxy” on me. So I will order something more fitted next time! This coat is a bit oversized but the quality and cutting is beautiful!!! It’s warm, soft ang stylish. I wish Aritzia can have more colours to choose. Love this coat! LOVE THE STYLE but gathers a lot of lint. I’m usually a size small but bought this in a medium which is a perfect oversized fit. The style of the cost is great but it does gather ALOT of lint as it is wool. Love it! It’s classic and timeless, really nice quality. Beautiful coat which seems like it's made with heavy and substantial fabric! Hoping it to be as warm as it feels! The fit is bang on the shoulders but the body is slightly boxy but it's expected for the style. The material feels great, it's super warm, and I love the coat's silhouette. The stitching on the collar is very thick though, but not super noticeable on black. The fabric is thick and so soft. It'll keep your warm outside but doesn't get too hot inside or in milder temperatures. The full satin lining means that it always hangs nicely and is a breeze to slip on and off. The flap pockets, chest pocket, and stitching give it so much more personality and style than other coats. If you're considering the stedman or another similar coat, go for this one instead. The fabric is nicer and the style is more interesting. Just know that it's very oversized so you should definitely size down. The size is truly truly large - I'm usually an xs, ordered an xxs... but it fits like a medium on me. The sleeves are long, the torso is very boxy, and the shoulders are barely fitted. However, I like it due to the boxy 'boyfriend coat' look, and i'll be happy to know all my thick wool sweaters will fit inside it. This coat is thick, long and very well made. Would love to wear it after i have the sleeves shortened. I wish you made coats for petite people. One issue i had was u sent me a very wrinkled coat. 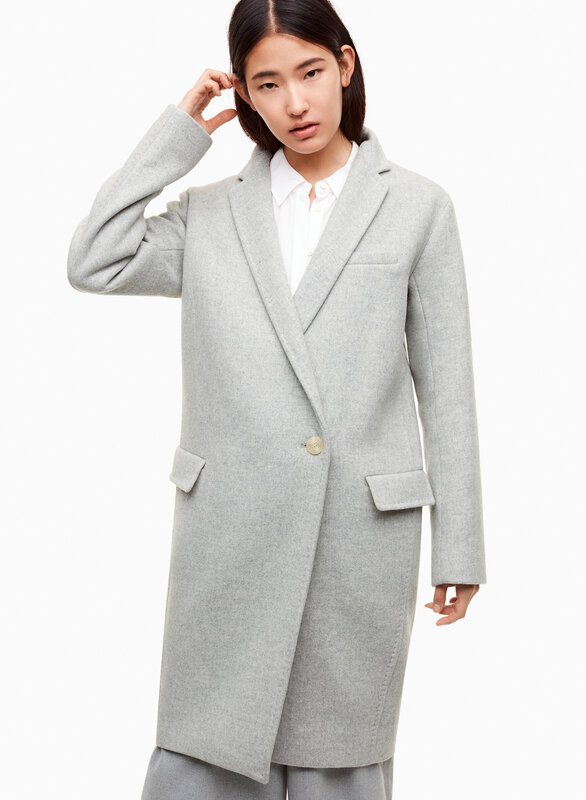 Ok fit but design not as nice as other coats at Aritzia. Fit fine, lining was nice. I ordered the grey and the colour was a little pale. The pocket flaps were bulky and cumbersome. The large stitching along the seams made the coat look cheaper than it was, and is not necessary. The fit is boxy and unflattering. 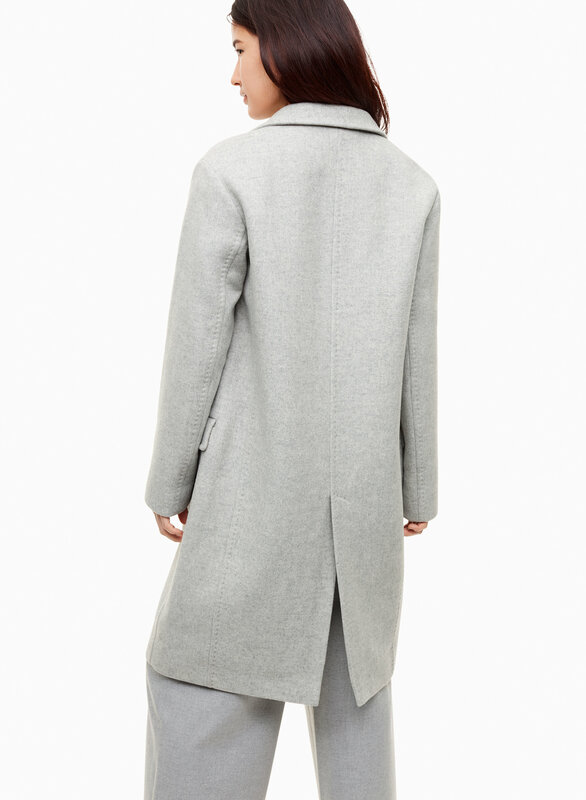 I returned and purchased a grey Stedman instead, much more flattering coat.